An unfeasibly long bus will soon to take to the streets of Colombia, though whether a driver will be brave enough to get behind the wheel is another matter entirely. At 26.8 meters long (88 feet), its Chinese maker, BYD, claims it’s the longest pure-electric bus in the world. It certainly looks that way. Thankfully for the driver tasked with controlling this hulk of a people carrier, the bus isn’t built in one long section. Instead, it features a bi-articulate design to make it easier to get around corners. Though it still looks like it’s going to be really difficult to get around corners. Or anywhere. 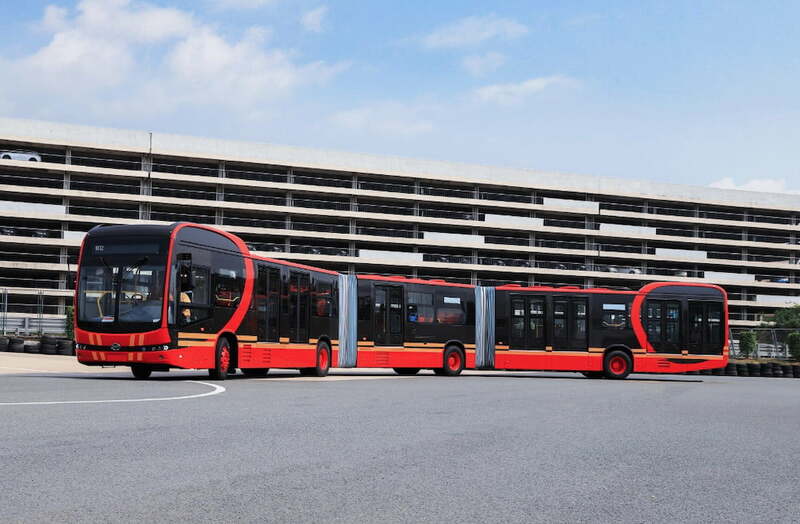 BYD unveiled the enormous “K12A” bus at the company’s headquarters in Shenzhen on April 1, at the same time insisting in a tweet that it was real and most definitely not an April Fool’s joke. The vehicle can transport as many as 250 passengers, though with so many people getting on and off the whole time, you have to wonder how long a trip around town will take. It can reach a maximum speed of about 45 mph (70 kmh) and travel up to 185 miles (300 km) on a single charge. The K12A will soon be deployed in the Colombian capital, Bogotá, as part of the city’s TransMilenio bus rapid transit system. A video (below) posted on Twitter by BYD shows the bus roaring across some open spaces, bending like a snake as it turns. If it’s used on anything close to regular city streets, however, handling it will clearly require a high degree of skill and concentration. BYD, which is short for Build Your Dreams, began business in 1995 and is a growing seller of electric vehicles, with the company enjoying healthy sales in its home country. The company opened its first U.S. factory in Lancaster, California, in 2012 and has so far sold around 750 electric buses in the country. A year ago it announced the sale of electric delivery trucks to Goodwill in San Francisco, and the company has also teamed up with U.S. Hybrid Corporation to build electric buses for Daniel K. Inouye International Airport in Hawaii. Just recently, in China, BYD launched what it says is the world’s largest pure-electric double-decker bus fleet in Xi’an comprising 200 vehicles, none of them as big as the K12A.